Talking to humans is passe. I spent more than a week talking to two circular objects – both of which were eager to play music for me, set alarms, answer queries and even play games. Hoping to god they do not become sentient, I had a great time pitching one against the other. One of them turned out to be more interesting than the other. Was it Google Home Mini or Amazon’s Echo Dot? Read on to find out. Smart speakers are all the rage these days. Whilst slow to come to India, the west has become enamoured by speakers with virtual assistants built in. The most popular smart speaker of them all is Amazon Echo followed by Google Home which is trying hard to catch up. Even Apple has dipped their hands in this category with their upcoming HomePod. The Google Home Mini is a smaller version of the Google Home smart speaker the search giant launched last year. It looks funky and has the Echo Dot beat in the design department. Its soft, rounded shape not only lends it a very pleasant and homely feel but sets it apart from the rest of the utilitarian gizmos in your plasma stand. The only question mark is the textured fabric which is sure to accrue a lot of dust and muck in the long run. The Echo Dot is not lacking in the design department either but just does not feel as special. It is slightly utilitarian in comparison. It looks like a Bluetooth speaker in the shape of a hockey puck. The glossy black finish adds a bit of design flair but is also a dust and fingerprint magnet. However, the understated look could be an attractive proposition for those who find the Google Home Mini’s design a bit too out there. Both the Echo Dot and Google Home Mini have very different approaches to life. The Home Mini is a smart speaker through and through and comes with a respectable speaker built in capable of belting out tunes – albeit with compromised sound quality. To put it simply – you can listen to music on the Google Home Mini if you want to but you will not really enjoy it. The audio performance is equivalent to a cheap pair of Bluetooth speakers. The only way to connect the Google Home Mini to an external speaker is by purchasing a Chromecast Audio which involves another investment of 3,000 rupees. The Echo Dot on the other hand has a pretty sub standard speaker built in – good enough only for Alexa’s voice commands. Listening to music via the internal speaker is a terrible experience. 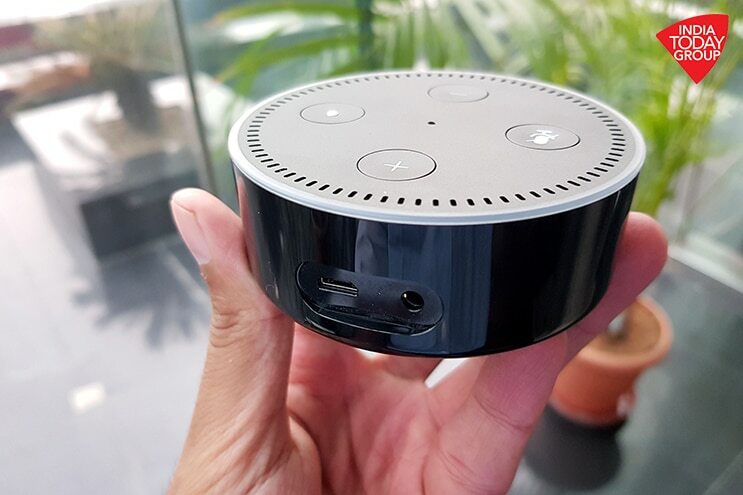 However, the Echo Dot has a nifty trick up its sleeve – the ability to transmit audio to any external speaker via a 3.5mm audio out port or Bluetooth. This dramatically increases its functionality. You can connect the Echo Dot to any decent pair of speakers lying around the house – or a kickass audio system if you have one – and listen to tunes in high quality audio. In fact, Amazon advertises the Echo Dot as a device that “adds smart functionality to your existing speakers”. 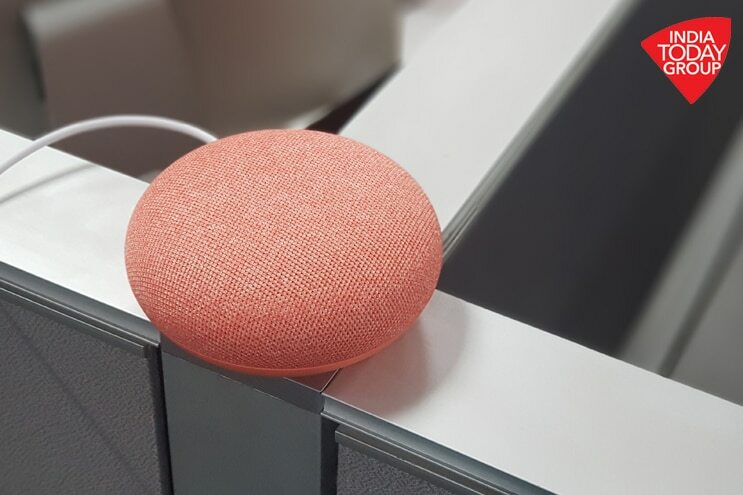 The Google Home Mini plays music via Google Play Music – you can ask it to playback songs by artists, albums and playlists. It can also play curated radios according to mood and genre. The Amazon Echo Dot on the other hand can play music via three sources – Amazon Music, Saavn and TuneIn Radio. And the implementation at the moment is a bit iffy. As Amazon Music has not been fully launched in India, you cannot make personalised playlists or control playback via your phone. Also if you have both Saavn and Amazon Music enabled on the Echo Dot – even with one chosen as the default – the device gets confused as to which service it should play music from. On the plus side, you get access to a vast array of radio stations, including India’s own, via TuneIn Radio. Both the Google Home Mini and Amazon Echo Dot are multi-purpose devices that can be many things to many people – a dictionary, a music-spinning DJ, an encyclopaedia, a witty game show shot, a cooking instructor, a work planner and even a companion or someone to talk to in bitter, lonely nights. Both devices are powered by their respective voice assistants. The Echo Dot has the power of Alexa under its hood while the Google Home Mini offers the wonderful insight of Google Assistant. Currently, there is just so much more you can do with the Echo Dot here in India. And the reason behind the same is that Amazon has tweaked Alexa’s services for the Indian market. The Home Mini on the other hand is not officially available in the Indian market yet – making this comparison slightly skewed. Fret not, we will do a round two as soon as Google launches the Home Mini in India – which is set to be very soon. Even without the Indian makeover, Echo has an ace up the Home Mini’s sleeve thanks to the presence of skills. You can link third party applications like Go Ibibo, Ola and so on to the Echo Dot dramatically increasing its feature set. There are multiple categories of apps on offer which can be linked – Lifestyle, Movies & TV, News and Productivity to name a few. Another extremely useful feature is called ‘Flash Briefing’ wherein you can add multiple news providers like India Today and make your own personalised list. Then as soon as you say “Alexa, what’s my Flash Briefing?”, it will read news aloud from the sources you have listed – in the order you have listed them. There is also a Sports Update which works in the same vein. You can also ask Alexa to read your Kindle books aloud – a feature I found particularly nifty. None of these features are found in the Google Home Mini as of now. Yes you can ask it to read news but the only news source on offer as of now is BBC News. In the Google Home Mini, what works well is using it to play music, setting up alarms, viewing your calendar appointments, asking trivia and hearing the weather forecast. Google Home Mini is also a better game show host than the Echo Dot – much more livelier and entertaining. There are two games on offer as of now with Google promising a grand total of 50 games by the end of this year. While both products are compact and petite and offer a great entry point into the world of smart speakers, the Echo Dot is the one to acquire at the moment. There are two reasons why it wins over the Home Mini as of now – the ability to playback audio via external speakers, which greatly elevates the device’s functionality and the fact that is tuned for Indian accents and Indian apps and services. However, the Home Mini will definitely strike back when it launches officially in India as Google is sure to bring in services and features optimised specifically for the Indian market. Till then, the Echo Dot (available right now at an introductory price of Rs 3,149) is a stellar buy.